An LTE core network that can be installed on a single board computer and reach data speeds in excess of 90Mbit/s. Saturn Eclipse has developed all components needed to deploy an LTE core network. The entire network software can run on a single board computer where it can support multiple eNodeBs and can deliver data speeds in excess of 90Mbit/s to a single handset. The software solution requires minimal configuration to install and is compatible with a range of eNodeB vendors. The LTE EPC solution has a user interface that enables the user to deploy a fully-functional LTE core mobile network with ease and no specialist knowledge. The EPC can be deployed with a number of eNodeBs and service LTE enabled handsets. All software components are developed to the LTE standards and provide all of the commonly used features of large network equipment vendors but in a compact modular design. The MME is the main control node for the LTE access-network. Through the Non Access Stratum (NAS) protocol, the MME is responsible for authenticating, tracking and paging procedures, generation and allocation of temporary identities to UE's, bearer activation/deactivation process and for choosing the SGW for a UE during the initial attach procedure. The MME is the termination point in the network for ciphering/integrity protection for NAS signalling and handles the security key management.  The SGW is a data gateway for user data packets. The SGW routes encapsulated IP data to a PDN gateway to access an IP network. Responsibilities of the SGW include setting up and removing bearer routes on MME request, forwarding user data and acting as an anchor for Intra E-UTRAN handover. The SGW manages data resources by terminating the downlink data path to idle UE's and triggering paging procedures when downlink data arrives. The PDN Gateway provides a termination point for tunnelled user data from a UE to an external IP data network. A PDN gateway is typically responsible for allocating IP addresses to UE. The HSS is a central database that contains subscriber account information. Functions of the HSS include: mobility management, call and session establishment support, user authentication and access authorization. The EPC-UI is a web based application which gives the operator the ability to configure the LTE sub-system parameters, view their statuses and perform operations on each. The main function of the EPC-UI is to provide provisioning and management of subscribers and to configure their access and priority profiles. © Saturn Eclipse Limited. All Rights Reserved.